I want to share with you something that is along the lines of health and fitness… I know this is a beauty blog, but what is more beautiful than being healthy? At the beginning of 2012 I decided that I wanted to get healthy. Sure I want to drop some weight but I really want to make this the year that I change the way I eat for good… No longer looking to food for comfort or snacking out of boredom. Food is for nourishment. I know that this is the last thing that some of you want to read, but for those of you that don’t wanna hear all about the healthy stuff and want to continue eating things that taste good you can keep reading too! This post applies to you too! I discovered these a few years back and I get on my Green Monster kick here and there throughout the year. Everytime I commit to having one of these smoothies for breakfast over a longer amount of time I drop some weight without even trying. They are good for you and taste REALLY good. The ingredients are surprising. It consists of a banana, low-fat yogurt, spinach and ice! Yep, that is it. There are lots of different versions of the “Green Monster” out there but this one is the basic one and you can add anything you want in the mix. I typically add a dash of Splenda and maybe a touch of milk to help the blending process. The reason that this smoothie is so healthy is because of the spinach. It has so many nutrients in it and it is high in fiber. The banana and the low-fat yogurt add flavor without adding a ton of bad stuff in the mix. To start making this you need around 2 cups of raw baby (organic if possible) spinach. I don’t measure this out, I just grab 2 fistfuls and stuff it in the blender. I then take an entire banana and break it into a few pieces and add that in the blender. And I add about 1/2 cup to 1 cup of the low-fat yogurt. Any yogurt will work but I try to stick to any low-fat vanilla. You also need ice. The ice probably shouldn’t be on the bottom of the blender the way is pictured below. In an ideal order it would likely go on top. Things that weigh the least should be on the bottom so that the weight forces it into the blades to blend faster and smoother. I wanted to get a shot of the top of the blender as well. In the top right hand corner of the picture you can see where I threw in my spoonful of Splenda. This is really a very yummy treat and even my 6 year old likes it. He has been drinking them since he was 3 years old: that to me says more than any adult telling you it is delicious! So… blend all the ingredients together and let the blender run until you can’t see anymore peices of spinach. It may take a few minutes but you really want it to be completely liquefied! And there you have it! 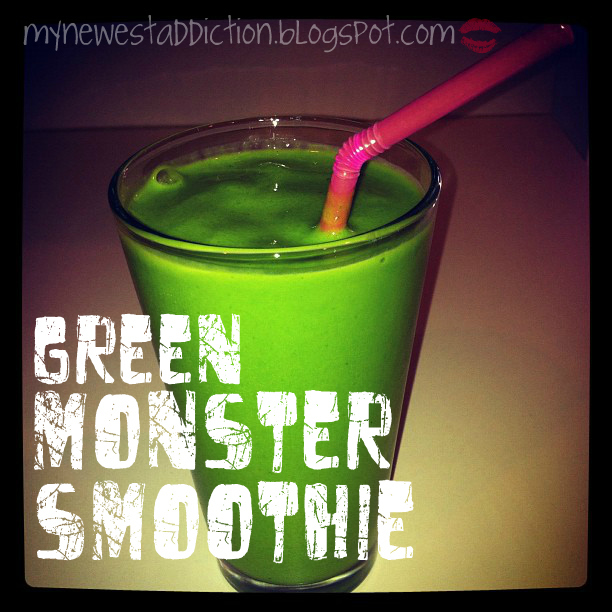 A Green Monster Smoothie. If you haven’t tried this before, give it a shot. It sounds weird but it is soooo delicious! Thank you for taking a minute to read my blog! I appreciate your time!